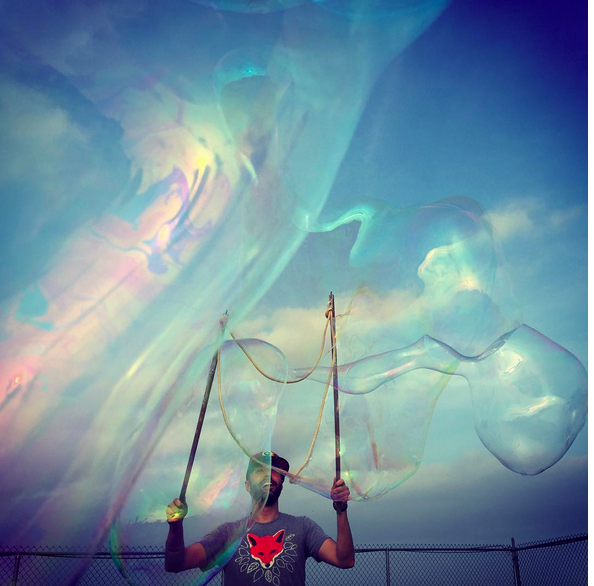 The bubbles of Bushwick are majestic. I've seen bubbles sailing off rooftops, I've seen bubbles swirling around my feet while standing in line for Roberta's Pizza, and I've seen bubbles fly out of the Morgan Avenue subway station. Bubbles everywhere, and everyone seems to love them. Co-founder of One Month. Faculty at Columbia University. Last Saturday, as I sat watching the bubbles, it occurred to me that making bubbles must be the cheapest and quickest way to make just about anyone happy. It's amazing how much joy people get from such a simple, temporary thing. On one hand, I believe Rondeau is selling the art form short by saying that his Bushwick bubbles don't demand any attention. They're quite enchanting: I've seen the huge, 10-foot wide bubbles slow club kids to a whisper, and the smaller bubbles lead both children and adults in energetic pursuit. Yet, I can understand the comparison to Eno's art; shortly after the bubbles leave the wand they are absorbed into the background, gradually and then all at once. They become part of the landscape. The fenced-off Boar's Head distribution center never looked so colorful. The Wonton Food Inc. building never so soft. The McKibbin Lofts so serene. One of the most wonderful things about the bubbles is that they bring people together. Rondeau tells me, "I've met almost all my neighbors and some new friends as well." 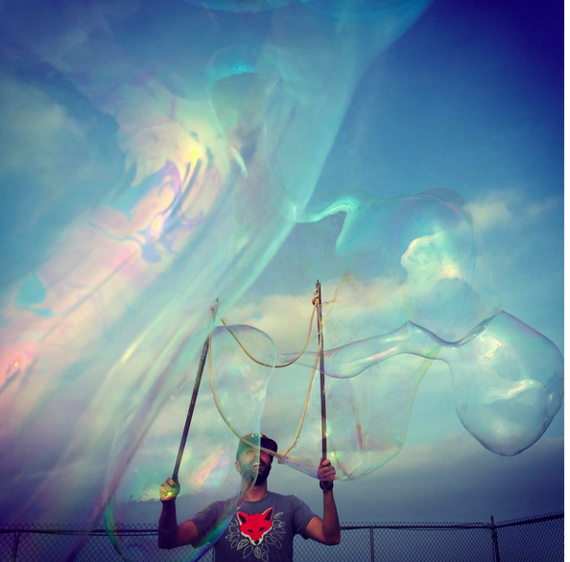 Make bubbles and you are making people happy. And the happiness that comes out if it is disproportionately higher than the effort that goes into it. If you put in 100%, what you get back is 1000% percent. Cover the world in bubbles! Tips & Tricks: Bubbles are sensitive so avoid hot sun. Dry air and too much wind will make 'em pop too quickly, too. If you decide to bubble your city! Write to me and let me know! I'd love to see. I'm @castig on Twitter. Bushwick is a feeling. Now spread that feeling. Bubble safely! Subscribe to Chris's YouTube Channel to receive his weekly videos. Join Chris's email list to receive more of his writing.